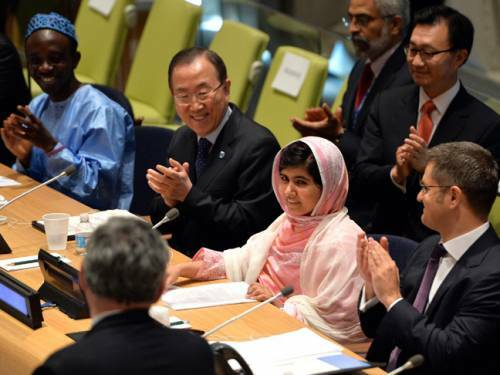 In a powerful and moving speech at the United Nations, Malala Yousafzai called on women and girls not to rely on men to provide them education, but to demand it themselves. She said,“Malala Day is not my day, today is for… every girl who has stood for her rights.” Showing signs of a nearly complete recovery from her head shot wound by a Taliban gunman last October, she spoke forcefully and clearly with only a slight sign of lingering paralysis of the left side of her face. The full speech can be seen here by Canadian Broadcasting News.